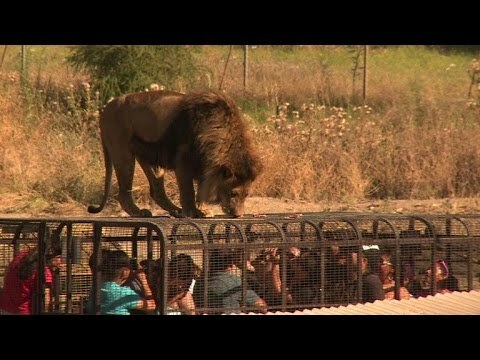 ‘Don’t pet the animals’ – this is what is encouraged at Parque Safari zoo in Chile, a sanctuary for mistreated circus animals that turns the traditional zoo-going experience. In this one of a kind zoo, instead of animals, visitors are caged in vehicles and drive around the two-hectare park where the lions roam free; the hulking carnivores get to look at the humans from up close. Most of the animals at the Parque Safari are too familiar with the life in a cage. The zoo takes in lions, bears, monkeys and elephants from circuses where they have been abused and works to rehabilitate them. The Chilean authorities have rescued these animals and we have brought them here because they can’t be freed, they have lost the ability to hunt and survive, said the director of Parque Safari, Ivan Sanchez Lobos. Inside the safari, tourists travel in a cage-like vehicle, and the lions are free to examine and walk atop the cages. It’s a rare kind of thrill and, hopefully, entertaining for both parties.